Nothing says Christmas in Europe like Chocolate Covered Marzipan! It is something I look forward to making every year. And now that the first snow has fallen and our Christmas tree is up and decorated, it is time to make them! So what is in Marzipan? It is simply, sugar and finely ground almond meal cooked down and then molded into any shape or covered with chocolate. This recipe is far quicker and easier to make than the traditional cooked version. 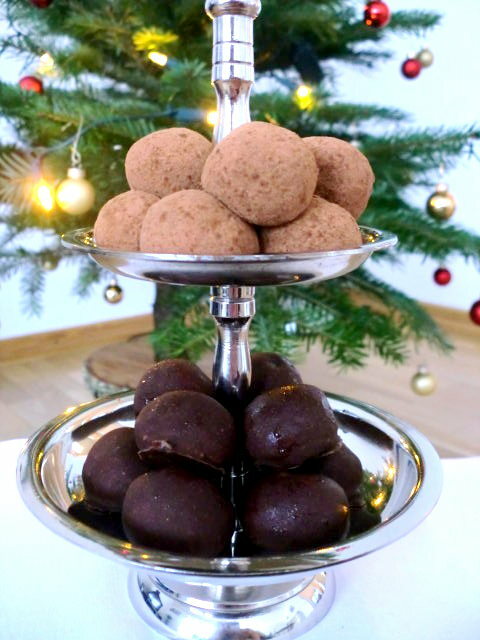 And I know the Christmas season is hectic so I’ve offered two chocolate covered alternatives to the recipe: a quick Chocolate Powder Dusting or impress your guests with a rich Belgium Chocolate shell! Guten Appetit!! In a small bowl fold in the almond meal, agave and bitter almond essence with a spatula. With damp hands and using a 1/2 tablespoon size measuring spoon, measure and roll into small compressed balls. In a shallow bowl shift the cacao powder and cinnamon. Roll each marzipan ball in the cacao powder until completely covered being sure to shake off excess powder. Follow the directions and ingredients for dipping the Marzipan in Belgium Chocolate. Let set in the fridge until just before ready to serve. Serve on a silver platter. This entry was posted on December 6, 2010 by Olive. It was filed under Raw Food . Oh Baby, if these little devils don’t get one in the Christmas mood, what will? They are beautiful and I bet you had to try at least one while you were making them! Love the picture Carla with the little tree in the background. Wow! Those babies look delicious. Transported me right back to the holiday time, living in Germany. Thanks! Amie, get to whole foods (I know there is a huge on in NYC) and get the ingredients! They are so simple and yummy without feeling guilty! These look awesome! I definitely want to try this recipe. I love Marzipan.